We spent 3 weeks at our villa in Crescent Lakes during the winter Holiday Season. It’s our home in Florida, and we try to visit it at least twice a year, because we love it. 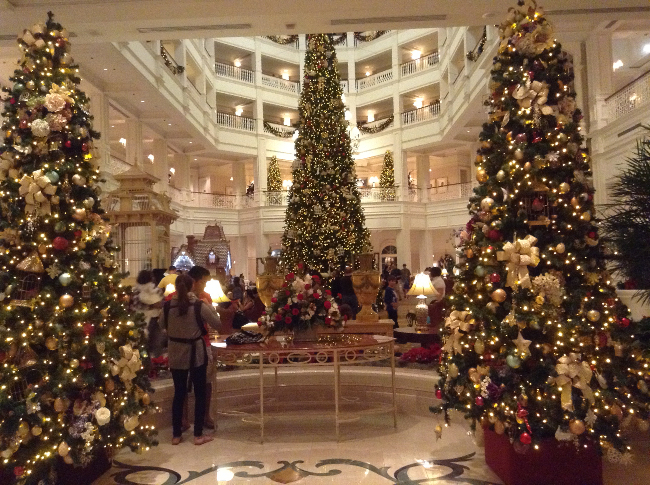 The winter Holiday Season is a great time to visit, because it is such a magical place. We went to Celebration to visit the homes decorated with light displays. They are amazing! !…The displays on Jeter Bend Drive were particularly spectacular, and included synchronized sounds, water effects, snow and even Disney Films!! It was great to watch the local children screaming with delight. I love visiting the Disney Parks, but it’s only recently that I have discovered some of the things you can do in Disney that are free. I guess everyone knows about Downtown Disney and the Boardwalk, but did you know that you can visit Disney’s Grand Floridian Resort & Spa, even if you’re not a guest there, and enjoy sitting by the lake at 9pm watching the fireworks for free? We did this for the first time last year on New Year’s Eve. The fireworks at midnight are really awesome. I will never forget seeing the countdown in the sky and then the explosion of fireworks from 18 different locations erupting everywhere I looked. Just writing this now reminds me of the excitement I felt…I can feel that excitement right down to my toes!!! Disney offers so many unforgettable experiences. I was talking to LanceAround and Mrs. LanceAround about my discoveries and they told me there are many more great things to do that are free. Such fun!!! You can visit all of the Disney hotels, and of course you can use many of the ferries, and the monorail to travel around. The LanceAround family took us to explore Disney’s Fort Wildnerness Resort campgound…Every night they have a sing-a-long with Chip and Dale and then show a Disney movie. When we arrived, we had just missed Chip and Dale, so we will have to go back again next time we visit, but we did make S’mores on the campfire while the movie played on the outdoor screen…I sound like I know what I’m talking about when I mention S’mores by a campfire, don’t I?…But I confess I only just discovered the delights of toasting a marshmallow and squeezing it with some chocolate between 2 graham crackers…Oh my…it tastes so good !!! !…I never encountered this in the United Kingdom…I’m taking this idea back home with me…Can’t wait to show my 4 grandchildren how to make S’mores!!!! I have bought some graham crackers to take home with me, but I’m not taking any Hershey chocolate–cos Cadbury’s chocolate is so much nicer!! Promise!! I remember the day it was time to go back home…felt a bit sad…but I’ll be back again soon. This entry was posted on March 23, 2015 at 11:42 am and is filed under Vacation Rental Homes. You can follow any responses to this entry through the RSS 2.0 feed. You can leave a response, or trackback from your own site.